This stir-fry recipe is a bit special because it's served on a bed of fresh citrus fruits, which makes it a blend between a stir-fry and a salad. Some citrus juice is also included when cooking the beef, which gives it a nice tangy taste. 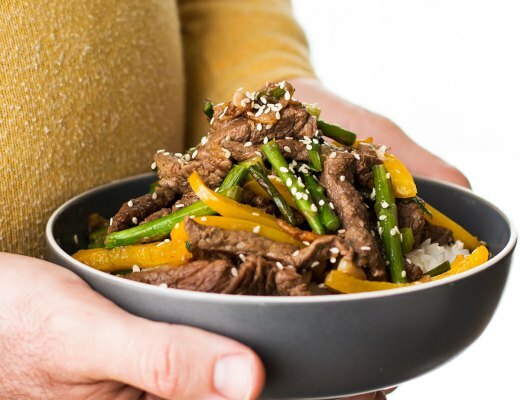 Stir-fry the beef with tallow or clarified butter. Remove the beef from the wok, make sure the wok regains its temperature, add more cooking fat and stir-fry the onion, ginger and garlic for about 3 minutes. Return the beef to the wok and add the orange and lemon juice. Bring to a boil and add the bunch of spinach. Cook until just wilted. Serve on a bed of citrus with the segmented lemon and orange.